Dedicated to Lord Shiva, the temple of Bhojeshwar in the hamlet of Bhojpur in Madhya Pradesh remains incomplete till date and is home to a massive Shivalingam. The construction of the shrine is said to have started in the 11th century by a king named Bhoja who belonged to the Paramara dynasty. The reason behind the incompleteness of the shrine remains unknown till date. The unfinished materials found here along with the various architectural drawings and the mason's marks suggest the construction happened in the 11th century. Going by a Jain temple, which shares the same mason's marks as the ones found at the Shiva shrine, which dates to 1035 CE. Apart from this there are several literary works, such as the Chintamani Sarnika, which was composed by the court poet Dasabala. The poem holds up as historical evidence, which proves that King Bhoja ruled the area in the above mentioned time period. The area around the shrine is said to have had three dams and a reservoir. Construction of such a mammoth structure would be possible only under the leadership of a powerful ruler like Bhoja. The temple is said to have been originally built on the banks of a huge reservoir, which was formed by the construction of three dams during the reign of King Bhoja. The first one was built on the Betwa river, which trapped its waters in a depression surrounded by hills. The second one was constructed in a gap between the hills, which is located close to the present day Mendua. And the third dam in Bhopal brought in more water to the Betwa reservoir. 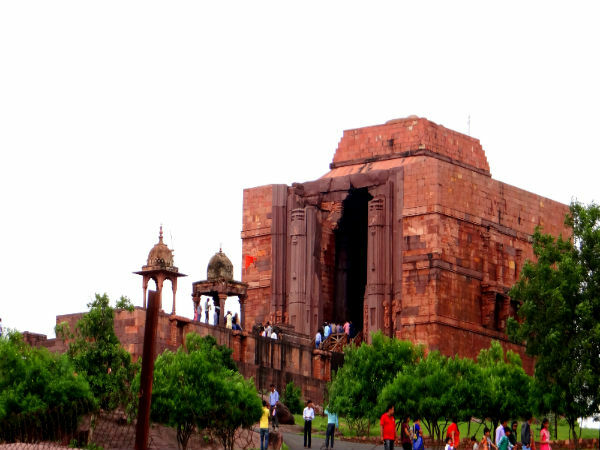 The Bhojpur shrine showcases several unique elements such as the absence of a mandapa which is connected to the sanctum and a rectilinear roof instead of the typical curvilinear tower. Three walls of the structure's exterior remains plain while there are some carvings on one wall, which happens to be the entrance, which dates to the 12th century. Based on these unique features, researchers and historians proposed that the shrine was a funerary monument. Some of them say the superstructure was built as tribute to Sindhuraja, who was Bhoja's father or to his uncle Munja, who had a humiliating death in the hands of their enemies. The construction of the structure appears to have stopped abruptly and the exact reason behind still remains a mystery to be solved. Historians think that the construction must have been stopped due some sort of sudden natural disaster, lack of resources or due to a war. The structure was restored during 2006-07, prior to which it did not have a roof. Archaeologists feel that the roof must have collapsed due to a calculation error made while calculating the load due to which Bhoja must have abandoned it. One can find detailed architectural plans which are engraved on the rocks found in the nearby quarries which indicate that the idea was to build a massive temple complex with many more shrines. But sadly it was left to be incomplete. If it was completed, it would have been one amongst the largest temple complexes in the country. The temple is built upon a platform which measures 35 m in length, 25 m in width and 13 ft in height. Above the platform is the sanctum which houses the large limestone lingam which measures to over 40 ft in height, which includes a square platform atop which the 7.5 ft lingam is installed. The walls of the temple do not have any windows and are constructed using large sandstone bricks. Before the restoration, the walls did not have any concrete material used. The walls in the north, southern and eastern walls showcase three balconies which are faux ones with massive brackets for ornamental purposes. One can also find the ruins of a sloping ramp on the north-eastern corner of the structure which are covered with soil and sand. The ramp is 300 ft long and slopes upwards to a height of 40 ft, the ramp reaches up until the temple but at present there is gap between the two.